The Scent of Green Papaya won the Caméra d’Or prize at the 1993 Cannes Film Festival, a César Award for Best Debut at the French annual film award ceremony, and was shortlisted for the 1993 Academy Award for Best Foreign Language Film. Anh Hung Tran is the world’s most famous Vietnamese-born director and ranks alongside the very best Asian filmmakers working today; with just two shorts and five features to his name it has been an impressive and successful rise to near universal acclaim for Tran. Almost wordless and marked by great pictorial visuals, “The Scent of the Green Papayas” unfolds like great music. Eating, sleeping, and staying clean... Life's most basic concerns. 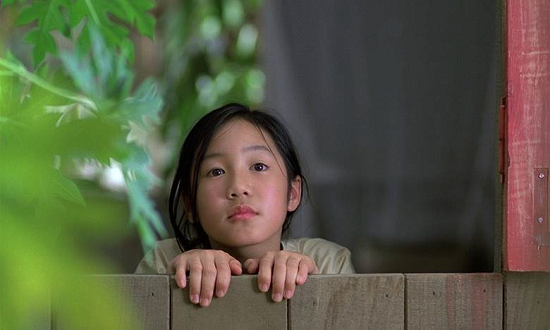 Yet they take on a transcendent quality in this visually delicious film that tells the 1940 story of a young orphan girl named Mui, who goes to work as a domestic servant in the troubled household of a Saigon merchant family. Under the mentorship of the family’s elderly housekeeper, Mui is a quick study in becoming adept at her daily duties, which she performs with diligence and grace. Early on, she learns that the family has lost a daughter named TA, who would have been just about Mui’s age, and over time, the mother’s affection for her grows, and Mui becomes like a daughter herself. Through her eyes, we witness the day-to-day activities of the household, from the preparation of food and daily cleaning rituals, to the troubled inner workings of the family dynamics. The mother, perpetually bereaved by the loss of her young daughter, runs the family textile business. The father, a self-centered man of dubious integrity, is wont to abscond with the grocery money, to go off on gambling and philandering binges for days on end. 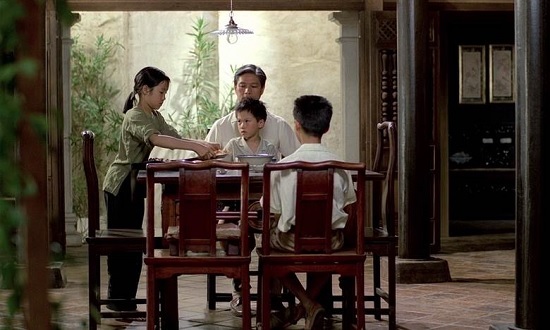 In the completion of her daily chores, Mui is beset by the impish antics of Tin, the family’s youngest boy, and overshadowed by the brooding discontent of Lam, the older boy, over his father’s frequent desertion of the family. 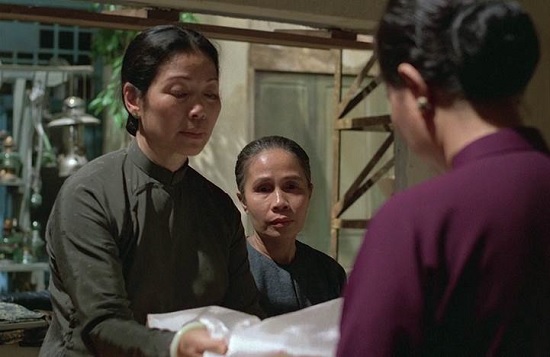 In Mui’s ten years with the family, Khuyen, the best friend of the eldest son, is a frequent visitor to the household, and by the time the father succumbs to a fatal illness, Khuyen has matured into an accomplished classical musician with a spoiled debutant for a fiancée and an elegant home of his own. The death of the father leaves the family in financial straits, and Mui is sent to work as a domestic servant in Khuyen’s home, where his fiancée regards her ubiquitous presence as a threat to her relationship with Khuyen. With Mui now grown into a stunning young woman, it is only a matter of time before Khuyen recognizes the beauty before him. The story is a simple one, without guile or subterfuge, so there is no need for deep analysis of symbols and metaphors. What makes The Scent of Green Papaya a work of art is the way that the cinematography showcases the lush and lovely sets, and most especially, the magically playful musical score, which adds an air of whimsy to otherwise mundane moments. Together, they capture the essence of everyday life in post-colonial Vietnam, yet ironically, the Scent of Green Papaya was filmed in its entirety on a sound stage in Paris. Writer and director Tran Anh Hung sees The Scent of Green Papaya as a portrait of a tranquil Vietnam unknown to most Westerners. On another level, the film is about everyday spirituality from an Eastern perspective. Mui, as a young girl, has learned the art of stopping the world. She savors the drop of milky sap on a leaf and looks with wonder at an ant carrying a heavy load. She dances the day instead of working it by relaxing into her chore. She has mastered the inner smile; her entire being radiates warmth and peace. And as a young woman, Mui shows that one must be patient with love, allowing it to unfold in its own special way. Then it can be cherished and tasted slowly. The Scent of Green Papaya is a delicate film, concentrating on individual scenes more than narrative or character development. 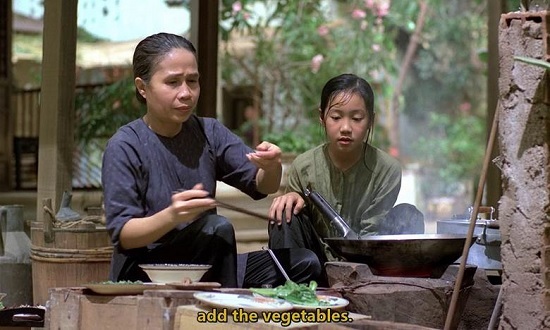 There are some beautiful and memorable sequences, a child pouring hot wax onto a troop of ants and watching them suffer, the youngest boy bullying Mui by first threatening to tip a bucket of dirty water over the floor she’s just scrubbed clean; urinating into an expensive vase and teasing her with a dead lizard hanging on the end of a fishing rod. The instant that younger Mui fall in love with the musician after serving him dinner, is an outstanding evocation of pure emotion, she walks away from the dinner table wearing an overwhelmingly genuine smile from ear to ear. 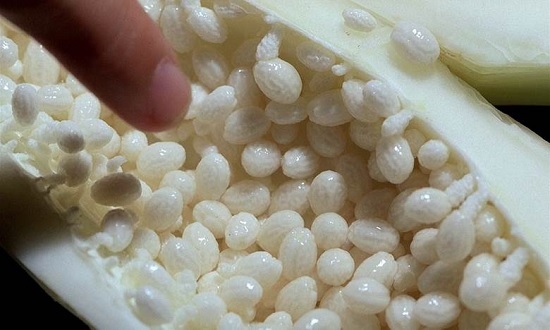 However the most memorable moment of the film comes towards the end as the older Mui prepares and presents a perfect meal for her new master to the sound of his playing Clair de Lune being played on the piano, although the success of this scene might be more accurately attributed to Debussy’s music rather than Tran’s filmmaking. 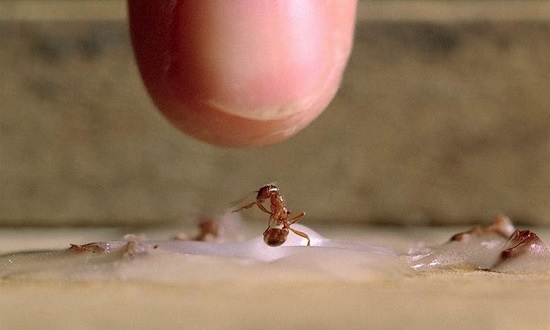 The film is punctuated by close-up images of the life surrounding the characters, ants picking up sugar lumps, dew falling from a plant, the constant sound of crickets in the distance, the white seeds inside an exotic fruit. There is something unmistakably sexual about much of the films imagery, yet never to the point of explicitness or vulgarity. The Scent of Green Papaya is a rich tapestry of images and sensations; the heat is constant, fans whirring, brows and bodies sweating; a deep tension runs underneath as the sounds of planes overhead and bombing alerts in the distance merge with the natural world soundscape; war is never far away, violence brews beneath the tranquil surface, both in the home and the nation at large. Tran’s focus on the characters feet is unique, from the bullying child resting his foot against the bucket of dirty water, to the eldest son slowly touching his mother’s foot to comfort her. It all adds to the sensual depiction of life, death, sexual awakening and separation. Perhaps the most interesting aspect of The Scent of Green Papaya that has not been touched on is what thematic nuance can be derived from the action seen on screen, and action is certainly the key word. Without claiming any expertise in Eastern Asian philosophy, The Scent of Green Papaya seems to be film steeped in Taoism. The Wu-Wui principle, in even its most basic form, as described by Lao Tzu, the mythical or historic figure often attributed as the founder of Taoism, could be seen as a rather apt review of the film at hand. Wu-wei is described as action through inaction, or more evocatively as purposeless wandering; it is the essential understanding that life is an interconnected whole that undergoes unceasing transformation. Wu-wei refers to a state of being where action is aligned with ebb and flow of nature, in more modern, Western, parlance it is the trite message ‘going with the flow’. It is arguably true that there has not been a film, or a character, that embodies the Wu-wei principle more than The Scent of Green Papaya, and Mui within it. Mui tires ceaselessly, but harmoniously, with the situations that are presented to her, her passivity is a trait to be strived for. 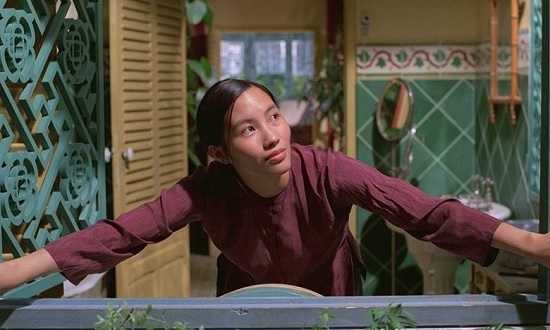 It may make the film meander on occasion but it certainly feels like Tran is presenting a self-actualized center; this ‘perfection’ is then brought to contrast in the second half of the film as Tran introduces modernity into the setting and a distinct female contrast to Mui in the form of the musicians’ fiancée. It is very difficult to get a complete read on Tran’s intentions regarding the comparisons between the female ‘competitors’ in this film, and it is up to the audience to form an opinion. The Taoist philosophy, as with most creditable philosophies is difficult to summarize, but it is often characterized as harmony with the natural universe, and it emphasizes compassion, moderation and humility. It is a philosophy that seems to parade through The Scent of Green Papaya, from the Taoist view that sexuality is a positive asset, easily correlated with the sensuality of the film, the kindness, simplicity and modesty shown throughout by Mui and action through inaction that Tran seems to substitute for plot of the film. The Scent of Green Papaya is an entrancing film that intoxicates and energizes us like a tone poem. It is a lyrical and magical movie-a delightful masterpiece — one of the best of 1994.